For dark sweet cherries, darkness is the true key to getting a ripe cherry. The darker they are, the sweeter they will be. 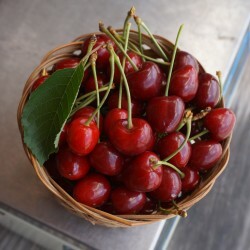 For yellow sweet cherries, you want to pay special attention to the rosy cheeks of the fruit. Rosy cheeks mean ripe fruit. Many of the really dark cherries can be found high up in the trees. If you brought your own ladder, feel free to use it. If not, please do not pull on the limbs as this will damage our trees. Young trees are not very thick and can snap easily! Keep stems on the fruit you pick—this makes them last longer. Our blog features cherry recipes like Cherry Cobbler and this Cherry, Goat Cheese and Arugula Pizza from Rachel’s Farm Table.